A waste of time. 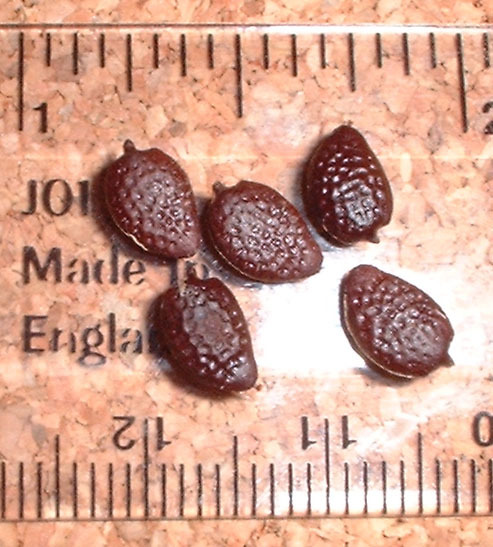 All Passiflora seed coats are thought to be permeable. Sandpaper, filing & nicking or damaging chemically is not necessary & will just increase the chances of fungal attack. Some seed may benefit from this to remove germination inhibitors e.g. P. incarnata & P. lutea. Long term application of cold is called stratification. See Germination inhibitors. I have tried this with P. incarnata and the seed have germinated within 4 days of being planted. Using bottom heat will help for most seed. Some need to be very hot to hatch out. I put them up to 38°C/100°F with a temperature drop at night. This seems high, but big compost heaps can reach temperatures of 60°C-71°C/140-160°F and the tropical jungle floor is like a thin compost heap – usually covered in a layer of leaf litter & animal droppings. Note that even Tacsonia which come from cooler cloud forest seem to germinate well at high temperatures but move to a cooler location with dappled light without bottom heat once up. There is no evidence that either light or dark affect Passiflora seed germination. So as they can benefit from light as an energy source the moment they emerge, germinate them exposed to it. Traditionally, gardeners have been advised to sow seeds at the full moon, perhaps because our ancestors discovered that seeds germinated more rapidly then. Some people today sow at the new moon in order to ensure germination before the growth spurt given the plant by the full moon. Probably not relevant to planting indoors in artificial conditions. If you are sowing seed outdoors, or planting, Moon phases may be important but there is no firm scientific evidence as to which & when, different sources of information being contradictory. Worth trying.